If you find yourself in Venice Beach (Los Angeles) craving a good cup of espresso and a vastly different cafe experience, head over to Intelligentsia Coffeebar on Abbott Kinney Boulevard. Intelligentsia roasts their own coffee and sources them directly from coffee growers they work with to ensure high quality. 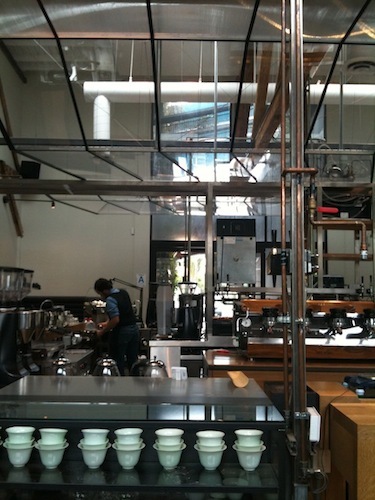 The coffee bar is a cross between a chemistry lab and a high-tech Italian bar/cafe. There are hardly any tables, just an open space with stadium-like concrete steps on which people sit with their coffee, croissants and newspapers (make sure you grab one of the cushions if you are going to linger).